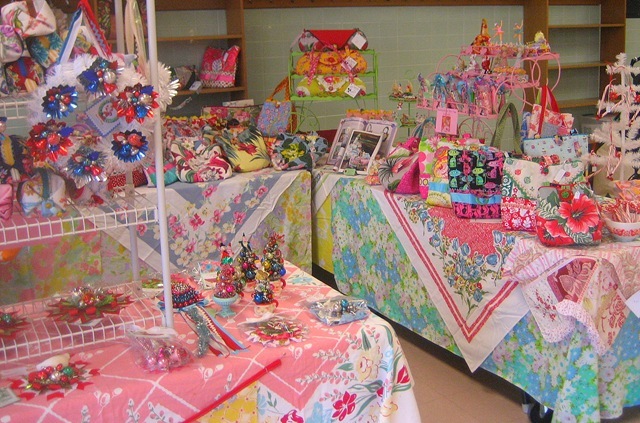 It was a quick trip, up to the DC area yesterday, craft fair today and now I am back home in Hampton. Tired and ready for a rest. 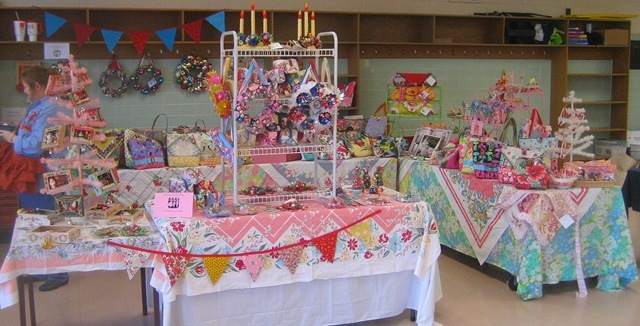 Beth and I had a great booth space this year at the craft fair. Thank you to everyone that stopped by and made a purchase. Thanks to friends that stopped by for moral support and some good conversation. OK, I'm exhausted now, I can barely raise up my glass of wine. Good night and sweet dreams. Your booths are a gorgeous riot of color! 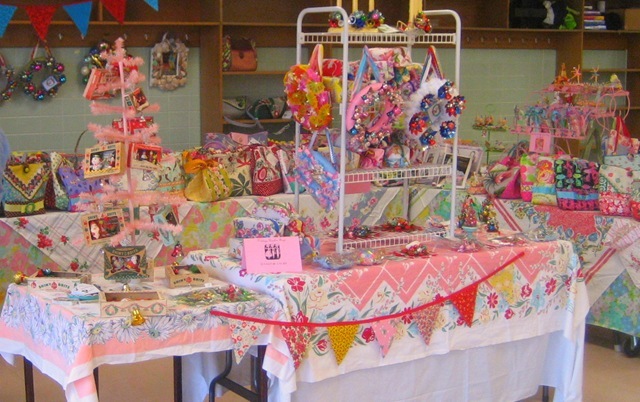 Looks like some very, very cute things – wish your craft show had been in my neighborhood! And I’m so tickled to know that you were the finder of the sweet pig that rests atop Elizabeth’s pincushion. Now everytime I look at him, I’ll think of both of you . . . and smile!! wow! what a lovely set up. I hope you had a good amount of sales to make the day worthwhile! FUN, FUN! Love how your booth is a riot of color. Hope the say was successful for both of you…now off to bed! Your booths are so colorful and cheerful! I love them! Great job, I hope your sales were equal to the quality of the display. That is a long way to go for a weekend of hard work. Lovely work, girl, you did a great job of displaying. I would love to come and see all of your beautiful designs. Oh, not only do I want everything on the tables, I even want the tablecloths!! hehehe!! Thursday Dec 3rd. SuzAnna’s Antiques Christmas Open House! Head on down! Seriously, that is the most gorgeous booth I’ve ever seen, and I’ve seen a LOT of them! lol I would not have even noticed the rest of the fair. Hope it was a huge success for you! 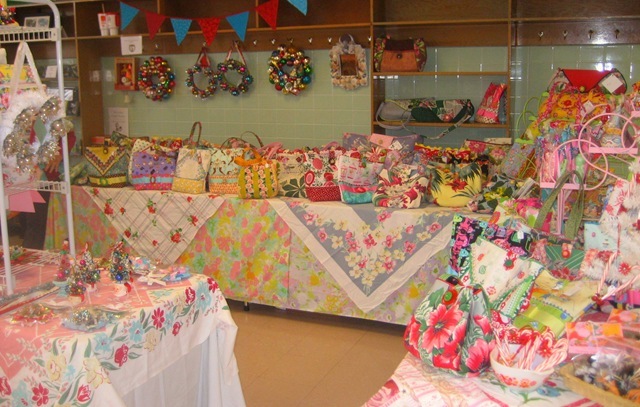 Oh, and also…it’s totally not fair for one one person to have so many beautiful tablecloths. REally. Share the wealth. Shame on you. Wow! So impressive! So colorful! So abundant! You girls simply must have more hours in the day than I do. 😦 I hope you did well. It looks super fabulous. I also meant to thank you for posting that trench pattern last week. Talk about perfect! I have to make one, too. thanks! Your booth looks wonderful! LOVE all the color!!!! OH, the colors and the fun things! I wish I could have come!!!!!!! Really!!!!!! I hope the show was great and you had a good time! I was at a horse show all day Saturday and I can relate to yout being so tired….I came home at 7:00 and went to bed! This looks lovely!!!!!! Colorful indeed, Suzy! Just my style. Now rest. Everything Looks wonderful Great Job! Some kind of booth space…great job. Christmas doesn’t have to be all about red and green. I love all of the pink in your displays and creations. Your space looked magical and I’m glad your show was a success! It’s like an explosion of happiness! Gorgeous! What an adorable booth!! I love the colors going on. Glad the show went well. I’m so sorry I missed your show! I’ve been falling behind reading posts and now look what happened … I would have loved to have supported your booth. But alas, no fun treasures for me. 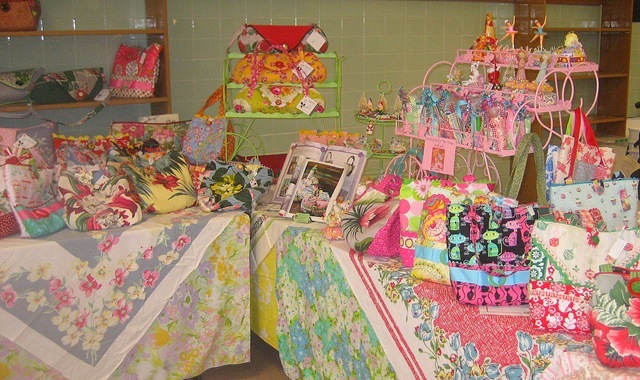 But a girl can dream… FYI- Maybe you two should set up at the Big Flea?